I am devoting this page to the Victorian houses of our era. I mean those homes built within the last 30 years or so that could blend in with the houses that our great-grandparents built. I am specifically referring to the Stick and Queen Anne and Carpenter Gothic houses that were common in the 19th century. Styles come and go, so it was perfectly appropriate for the taste for these homes to die out. Sometimes it takes a couple of generations for a style to return. In the case of the Victorian era it is more like four generations, but there is a renewed interest in this style of house. As I travel around the country, camera in hand, I am occasionally delighted to find a Victorian house built within the last few years. 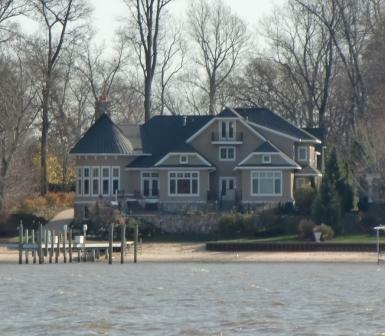 Usually these are custom houses, rarely a spec home put up by a developer. Unfortunately that interest has been dampened by the cost of trying to recreate that style. In many parts of the country there are enough old Victorian homes to satisfy the demand of the true aficionados of this style. If they buy an old house they are getting the original and not a copy, and the craftsmanship is often superior to what we can find today. The walls are real plaster, the roof is slate, the woodwork is superior and there are the odd quirks of living in a house built for a different era. However, they are often drafty, the windows are single pane, the trim is rotting and the wood is so old it doesn’t hold paint well, so for at least some people, new construction has a strong appeal. The problem is that builders have developed certain ways of doing things that work well with modern houses, but may not translate well into Victorian houses. For instance, labor is more expensive these days, and adding all those fish scales is labor intensive, so the cost of a true Victorian look makes it a pricey choice compared to your more typical alternatives. Pocket doors were common in the Victorian era and were a great way to maintain a relatively open flow while still allowing room to be closed off. Modern houses just go straight to the open flow and avoid the cost of pocket doors. If you want pocket doors it will add to your costs. The various fixtures that you find in a Victorian house are still available as reproductions, but they will cost you. To keep the costs down to a reasonable level you may find that you are compromising the look that you want. I am going to guess that there are quite a few people who considered building a new Victorian but backed out when they were told the bill. The either went with the more common developer built house, or they found themselves a neighborhood of old Victorian houses. 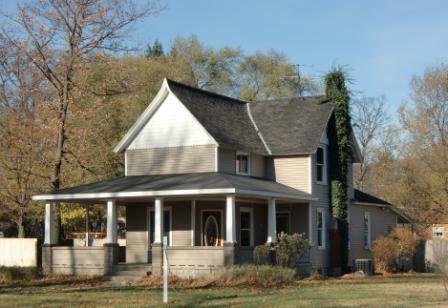 Just for comparison, I live in a 1906 Craftsman. It is relatively simple in its look, but the insurance company tells me that it would cost $250, 000 to replace it at the same level of quality. On today’s market it is probably worth $160,000. It is expensive to build a house that equates to the practices of the past. How much does it cost to build a true Victorian? Look at one couple did in Nebraska. These pics show the original drawing, the original house, the new house in construction and the completed reality. 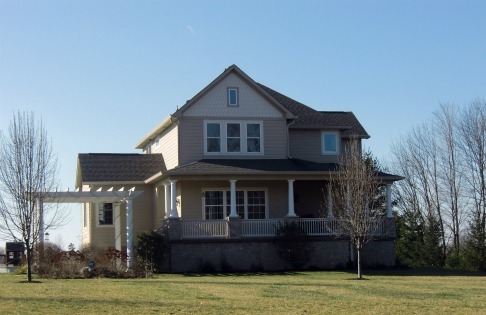 In 2002 construction costs for the new house totalled $1,060,000. 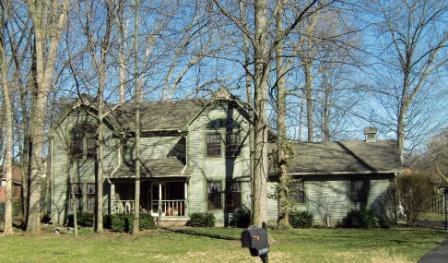 Unfortunately for the current owners the house is now (2012) being listed for $900,000, with 60 acres of land included. 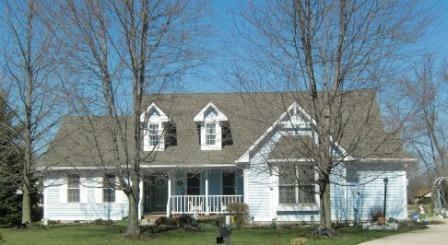 Click on the photo to visit the website showing all the details about this house. And yet…I am running across these new Victorian houses. 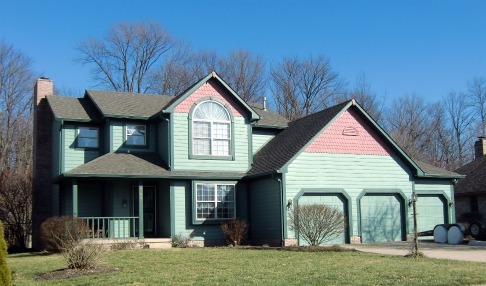 Chances are they have modern finishings, don’t have as many shingles, and sport an open flow floor plan. In some cases they are more of a synthesis, a blending of old and new, bearing some resemblance to newer styles but with the basic look and feel of the old houses. 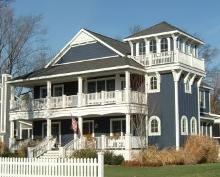 Some even sport the round turrets and the wrap around porches that were so common in houses of that era. Of course we have different needs and expectations in our houses. A house big enough to have servants back in the day will probably have a fitness room, an office and a home theater, so the floor layout will be different even if you are able to truly replicate the look and feel of the old style houses. So that you can see what others are doing with their new Victorians I am committed to filling this page with numerous pics. Perhaps they will inspire you. Enjoy your tour. These are new Victorian houses that come close to looking like they belong in an earlier era. Yet they will typically have some visual clues that tell you they were built recently. One of those clues is likely to be a large garage. Often this extends the house out to the side, giving it an elongated look that doesn't tie in well with the era. Window will typically not go quite as low, nor up as high, and ceilings are likely to be lower, making the houses appear squat. When it comes to the grander homes, houses are less likely to go up several stories and more likely to sprawl. Yet, if you use enough scale shingles and throw on a turret, a house that might otherwise bear a modern foot print can definitely look Victorian. Here are a few pics that went all out for the Victorian look. Some succeeded better than others. Perhaps you can leave a comment telling me where they fell short. This house does and excellent job. The garage is hidden in back and the footprint and shape seem right. There is something about this house that says "housing development". If you look at the house to the left you can see that it shares the same basic profile. The builder just threw on some scales and barge board. Still, it definitely bears a strong Victorian imprint. This house would be nearly perfect if you cut off the garage. It would also help if the turret went up another floor. Here each turret floor is connected to a floor of the main house. It was not uncommon for Victorian houses to have turrets that rose above the main walls of the house. Another very successful attempt. The floors are a little too short, and It would help if one of the gables actually had a third floor room behind it. Note how the third floor on the turret sells the Victorian idea. This house has a little less complexity than some of the others and yet it comes across as more authentic. These houses have Victorian influences but it is more in the form of a tribute to that era. I actually like some of these houses better. There is nothing wrong with a syncretic blend, it just depends on how well it is done. It can look kitschy or it can look beautiful. The houses below fall into both categories. This house borrows a little from the Gothic, but without the barge board. The pillars are Craftsman. It is a very simple house, but very lovely. I think a Gothic window in the gable would be a nice touch. It would break up the large blank space and provide light for that upper floor from another angle. All rooms should have light from at least two sides, whenever possible. It would probably require some alteration to the roof structure and the second floor ceiling, but what a wonderful effect it would have on the interior. 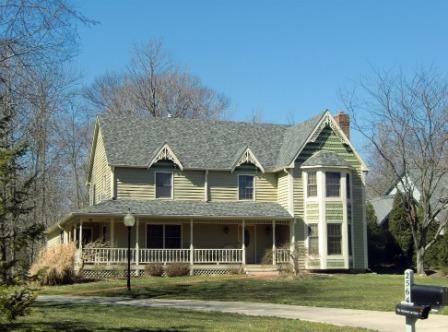 The gable shingles and the wrap-around porch are the main elements that tie this to the Victorian era. 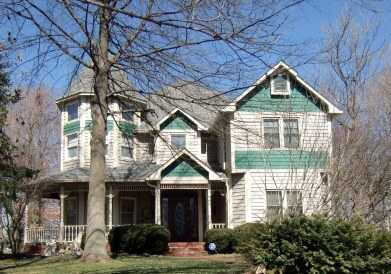 The classic columns show that this is a blend of styles. Overall, a very pleasing effect. It sits up fairly high, which makes it stand out a little bit more. The porch and the barge board are the two elements that combine to hint at a Victorian influence. The stark white says farmhouse to me, but this came straight from a builder's development. 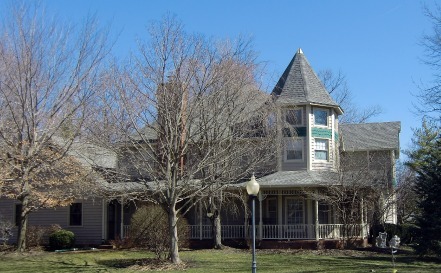 The two-story bay window, the shingles, the gable eave decoration and the spindles on the porch make a very strong case for this to be a Victorian house. The next photo is of a nearly identical house that just makes the case a little better. Compare the two and see if you agree. This house adds some barge board at the false dormer eaves. 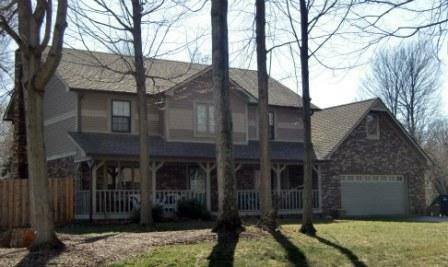 The porch also wraps around, and there are two colors of shingles on the main eave. I'd place this in the category of "True Believers" if they had included Gothic windows protruding into the false dormers. 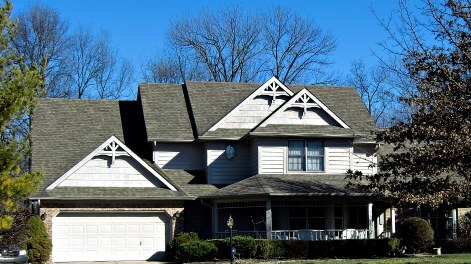 I am calling them false dormers because they aren't truly necessary. The room is not actually behind the roof. I don't think you would have found such a thing back in the day, but I am not certain on this point. The colors are in line with what you see on Victorian houses. The garage is not. This house screams "housing development" with a bit of shingling thrown on. There is something about the proportions of the sunburst window that speaks of a more modern aesthetic, but I can't quite say why. This is one of my favorites. They need to push the garage back so it doesn't dominate the house, but the house itself has lovely lines. The house and gable decoration are the only Victorian elements, but it has an old-timey feel. How's that for architectural lingo? It is a very well-proportioned house and the designer should be pleased with himself. The bargeboard at the gable eaves is the main paeon to the Victorian. I love the double, symmetrical bump-out framing the small porch. It creates a kind of pseudo-loggia. It is a very pleasing house. A little bit of gable decoration and the two-tone paint job are the only bits of Victorian that make it into this house. It barely makes the list at all, but it is perfectly appropriate to borrow a bit or a piece from a style without having to go all out. It doesn't always work, and you run the risk of having different themes clashing, but this is basically how new styles develop. The American Queen Anne style was a bit of Gothic, a bit of Tudor, and a bit of Jacobean mixed together to create something new and distinct. The gable decoration stands out on this house, and it has the bay windows, but there are some things I really dislike about this house. There is my usual gripe about the garage, but at least the garage door face to the side. Probably my biggest gripe is the color scheme. The sky blue and the brick don't work together. I think it is mostly the colors, but the textures also clash where you have the two-story bay pasted onto the brick wall. The bay should have been bricked as well, or better yet, just scrap the brick entirely. Well, every era has its design failures. Even Victorian houses of old include quite a few homes whose main virtues is that time has made their folly seem familiar. A simple little house with just a hint of decoration. It has a little gingerbread on the porch (barely visible in this picture) and a gable end decoration. This house looks inviting and pleasant. It is a cottage in all the best senses of that word. When we think of Victorian houses it is often the grand homes that come to mind, but there were far more simple homes built and many are worth emulating. How I love this house! It is an eclectic mix. It's windows are Roman not Gothic, its tower is square, rather than round or octagonal, and it has Italianate brackets. Still, it looks like something that would have come out of the late 19th century. For some reason it evokes images of coastal towns in New England. Since Victorian houses covers most houses from that era I think it is fitting to include this house. This house makes my list primarily because of its layout. 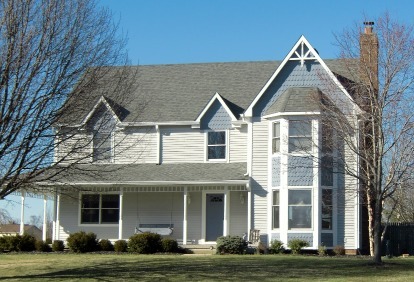 The complexity of its roof line and its round turret are familiar elements of the Victorian Style. The decoration is simplified, a product of our modern tastes, but the asymmetrical layout follows a line through the Victorian era back to a Gothic building ethic.